Serving Delaware, Marysville, Marion, Bexley, Dublin, Upper Arlington, Westerville, Washington Township, Mifflin Township, Sharon Township, Pickerington, Powell, Sunbury, New Albany, Blacklick, Hilliard, Lewis Center, Springfield, Lancaster, and more. With Gutter Helmet® shielding your gutters, you can be sure they will never clog, thanks to Gutter Helmet®‘s 100% lifetime manufacturer warranty. Unlike inferior gutter protection products, Gutter Helmet® guards your gutters even in the most severe weather—against heavy rains, blizzards, and ice storms. Gutter Helmet® keeps out twigs, leaves and debris that could clog your gutters so rainwater flows freely into the downspouts, protecting your foundation and expensive landscaping from water damage. What’s even more important, Gutter Helmet® protects your personal safety. No more climbing a risky ladder to clean the gunk from a slimy gutter. 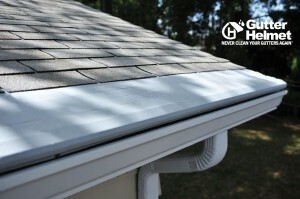 Get Gutter Helmet® and never clean your gutters again®. At Gutter Helmet® Columbus, our staff is professionally trained to guide you in choosing the right gutters for your home and installing them in minimum time. In addition to our professional installation and superior product comes our outstanding Lifetime Manufacturer’s Guarantee. Thousands of homeowners throughout the Columbus area are enjoying the peace of mind that comes with protecting their homes with Gutter Helmet®. Read what some of our satisfied customers have to say. With Gutter Helmet® protecting your home, you’ll never clean your gutters again—or pay someone to do the messy job for you. Gutter Helmet® works 365 days a year—eliminating damaging mold and mildew, filtering out every leaf and twig, keeping rainwater away from your foundation, and safeguarding your expensive landscaping from downpours. In addition, Gutter Helmet® needs absolutely no maintenance—its beautiful patented finish stays clean forever, enhancing your home’s appearance and increasing its value. Helmet Heat® protects your gutters and roof from winter damage caused by snow build-up or ice dams. Helmet Heat® is a hidden heating cable installed in the bottom of your gutters. It works automatically—providing energy-efficient heat only when weather conditions require it. And it’s maintenance free! Gutter Helmet® promises that you’ll never clean your gutters again. 100% Guaranteed. Gutter Helmet® stands constant guard against leaves, twigs, insects and other debris that clog your gutters. No matter how big your roof or how heavy the rain, Gutter Helmet® keeps the rainwater where it belongs—in the gutter and downspouts—safely away from your landscaping and foundation. Gutter Helmet® also reinforces your existing gutters, so that they stand up and resist heavy snow and ice dams. With the strongest warranty in the industry and over 34 years of experience, it’s no wonder Gutter Helmet® is Columbus, Ohio homeowners’ #1 choice for gutter protection. Serving Columbus, Ohio communities, including Chillicothe, Delaware, Lancaster, Marion, Springfield, and Troy. To arrange a free estimate, contact us at 1-888-543-5638 or sign up for a free estimate online today.